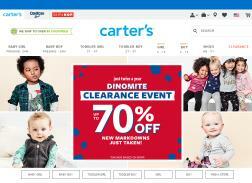 Carter's is the leading brand of children's clothing, gifts and accessories in America inspired by the joy and love kids bring into our lives. They believe that childhood is a celebration and have earned the trust of generations of families nationwide. Get 15% off Orders of $20 or More. One coupon per customer per day. Void Where Prohibited. Get 20% off Orders of $40 or More. One coupon per customer per day. Void Where Prohibited. Get an Extra 20% Off your First purchase when you sign up with email. Other Restrictions may apply. Get 50% – 70% off MSRP entire stock of Fall + Holiday. Get 20% Off Your purchase of $40 or more. One coupon per customer per day. Get 20% off your order of $40+. One coupon per customer per day. Cannot be used in combination with any other coupon offers, Grandparent Wednesdays or special military discounts. Cannot be combined, copied, transferred or sold. Altered, duplicated or reproduced coupons will not be accepted. Void where prohibited. Get an Extra 20% off your next purchase of $40 or more. Cannot be combined with other coupon offers or special discounts. Other restrictions may apply. Get Free standard U.S. shipping on orders of $35 or more. Valid on only one shipping address per order. Get 20% off your $50+ purchase. One coupon per customer per day. Cannot be used in combination with any other coupon offers, Grandparent Wednesdays or special military discounts. Employees not eligible. Get 20% off your purchase of $40 or more or 15% off $20 or more. One coupon per customer per day.